The new Yanmar 6AYM-WGT marine diesel engine weighed 400kg more than the engine it was replacing, yet provided better performance and lowered fuel consumption. Perth-based Mills Charters commissioned a new Yanmar marine diesel engine to repower its commercial fishing boat. 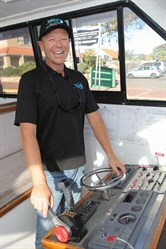 Blue Strike charter boat from Mills Charters out of Perth. Perth-based Mills Charters is a commercial fishing boat charter specialising in deep sea fishing, whale watching and private function boat hire. One of its flagship fishing boats is Blue Strike, a custom-built 70ft (21.3m) Conquest boat built in 1995 for the fishing charter market and currently operating from Hillarys Boat Harbour in Perth. Blue Strike stands high out of the water, has a 5.5m beam, and displaces 30 tonnes. She’s licenced to carry 30 anglers. The operators of Blue Strike knew she was getting on a bit. In particular, the original V12 European marine diesel engine was due for a rebuild. After much deliberation the owners opted to re-power, refurbish and re-fit with a Yanmar 6AYM-WGT commercial diesel engine. An off-season window of two months was allocated to take Blue Strike out of service. For a charter boat operator this was an ambitious program, as just four weeks were allocated to the Yanmar re-power aspect. abord Blue Strike charter boat. After consulting with marine engineers, propeller suppliers and Power Equipment (the authorised distributor for Yanmar diesel engines), the charter boat operator specified a Yanmar 6AYM-WGT marine diesel engine. The Yanmar 6AYM-WGT is a six in-line cylinder diesel engine rated to 911hp (670kw) at 1938rpm. It displaces 20.39lt and weighs (without gearbox) 2365kg. According to Yanmar, the 6AYM-WGT diesel engine is extensively used in many applications including heavy displacement workboats as well as high speed applications like passenger ferries, patrol craft and cray fishing boats. The repowering work was done by Aquadisiac Marine Services. Principals Rowan Horch and David Norton-Smith began by stripping the engine room in its entirety, installing the new Yanmar 6AYM-WGT diesel engine and re-fitting new marine electronics and a new exhaust system. The new engine weighed 400kg more than the engine it was replacing so it was positioned further for’ard in the engine room. A Yanmar YXH-240 transmission system was also installed to complete the power train. The original prop shaft and rudder were re-used but a new prop was fitted, being a five-blade 39 x 38 unit supplied by M & J Engineering in Fremantle. According to Blue Strike skipper Anthony Doupain, the new Yanmar diesel engine now makes a considerable difference in performance, cost, and service intervals. "With the Yanmar spinning over freely, the hull gets up and planes easily. In a following sea the hull doesn’t bog down and there’s always plenty of power on tap to punch the bow up." According to Yanmar, the engine, while heavier than the original, now does 18.5kts compared to the old engine doing 16.5kts. The engine service intervals have also improved, to 500 hours compared to 250 hours for the old engine. The new inline six-cylinder configuration is also said to make servicing and engine room access considerably easier.